This well-established hotel consists of two buildings, the first is decorated in typical Majorcan style, with stone pillars, wooden arches and a charming atomosphere, while the second has a more modern feel. The complex is ideally located close to the resort centre. Hotel bedrooms had been fully modernised to a very high standard. Tea/Coffee, mini-fridge and safe in room at no extra charge. This was our first visit to this hotel which has been upgraded to a 4* Our room was in main building but there is an annexe just next door which I presume lacked the original features but apparently had just as nice bedrooms. The food at dinner whilst decent quality did not offer much of a choice which was disappointing. The beach opposite the hotel was fab (so never used pool) and the resort was lovely. 10-15 min walk to the square in resort centre, bus stops outside hotel for Pollenca old village(15 mins inland - really lovely) and Alcudia old town (15 mins) also lovely. Would return to Uyal but only on B & B basis as there are loads of nice restaurants in the resort. Went Pollensa a few years ago while there we saw and admired the Uyal Hotel promised ourselves if we came back we would go there. We paid a lot of money to stop here and on arrival found ourselves in the ANNEXE. (This is the bit of the hotel that never appears in any brochure i have ever seen) while it is clean and comfortble it bears no resemblance at all to the Uyal and if I had wanted to stop in a concrete block rather than the main Uyal hotel I could have saved a fortune by going elsewhere. In the hotels defence both the staff and hotel were fine it was the selling of it that left a very nasty taste in the mouth. My wife and I usually go to cottages/private houses on holiday, but we were taking back to Mallorca her mother and her best friend who are both in their 80s and not too mobile, so we risked 5 nights at the Uyal. We were very pleasantly surprised and would recommend the hotel highly. We had 2 suites at the front of the older building: the seafront road outside is noisy, but the bedroom area of the suites is separated from the road by the balcony and the sitting area, so is quiet. 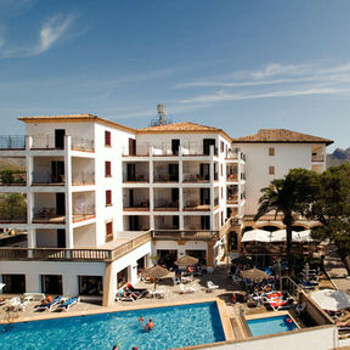 Apart from the traffic outside, the location is fine with the beach across the road and the walk to the centre of Puerto Pollensa takes only 10-15 minutes. Staff were helpful and friendly and we never had a problem finding somewhere to sit in the grounds in the afternoon. Most of the other guests were middle-aged couples (some others with elderly parents, too) but there were also a lot of younger cyclists, most of whom seemed to be staying in the newer, but more functional, annexe next door. It's probably not the place for those who look for clubs and nightlife, but it proved ideal for our particular party and my wife and I would happily go back on our own. We also got a good deal through Open Holidays (before the company's problems later in the year), but we know that you can still find similar deals through other holiday companies and also through discount hotel booking websites.